OSTROGOTH is Belgium’s pride in the world of Heavy Metal. The band doesn’t really need an introduction, since even James Hetfield from METALLICA knows the band. OSTROGOTH saw the light of day in 1980. Three years later, a demo was put, containing two tracks. That same year, the EP “Full Moon’s Eyes” was unleashed upon the masses. This release contained four songs. The band was on a roll, as the following years three full-length releases were added to their curriculum vitae: “Ecstacy And Danger” (1984), “Too Hot” (1985) and “Feelings Of Fury” (1987). In 1988, things got too hot and feelings of fury – by manner of speech – caused the band to split. They came back together in 2002 for the celebration of 20 years Mausoleum Records, for which the songs were recorded for the special live release of the label. But that same year, the plug was pulled again. Until 2010, when the drive to entertain the Metal population was popping up again. One thing let to another and after a series of gigs, it was time to make another recording. On a side-note, the band also has had its number of line-up changes, for various reasons. The last one being in 2014: guitarist Rudy ‘Whiteshark’ Vercruysse lost the battle with cancer. His wish had always been that, when he would have to step down (for whatever reason), Geert Annys (MYSTERY, STAINLESS STEEL, THUNDERFIRE, …) would be his replacement. And so it happened. 2013 was the 30th anniversary of the “Full Moon Eyes” EP and for their newest release, “Last Tribe Standing” (mastered by Jacob Hansen, known from AMARANTHE, PRETTY MAIDS, TÝR, ANUBIS GATE, EVERGREY, DESTRUCTION, ONSLAUGHT, VOLBEAT, and many more), the band decided to do the same as before: four songs, all killer, no filler. But when they checked out the live recordings of their festival appearances, it turned out they contained lots of potential material to be presented as well. As a bonus, you could say, you get four new songs and a live version of the “Full Moon’ Eyes” EP, since those live songs are exactly those from their first EP. 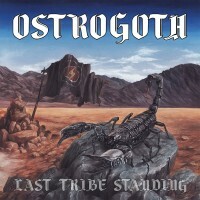 I’ve seen OSTROGOTH at work only once, at Wizzfest 2013, as you can read here. Other than that, no sign of the band in my music collection. With “Last Tribe Standing”, that problem is solved. The EP kicks off with “No Risk Taken”. It all begins with an atmospheric guitar intro. Soft singing is added, so as not to disturb the mood. But when power button is touched, that’s when things start to rock, albeit not in a fast manner. It’s a slow rocker, by the book, but in the chorus the music seems to flow more freely. The song becomes firmer, gets a little faster halfway. Of course there’s room for the obligatory solo and even musical variation. All in all, not bad as starter of the EP. “Clouds” is a better, catchier song. And faster. Not that speed is key, but when one plays classic Heavy Metal, it is key. That’s also why they chose this song to shoot a video clip. See here. Twirling guitars are the first sounds you hear, followed by the typical harmonics of the past. The band slows down for the bridge later on. Or, they reined themselves in. It drags the whole thing down, especially when the band was on a roll at that point. It’s like you’re cruising on the highway – well, driving at a high speed, in any case – and suddenly decide to slow down and change to third gear or so, when previously you were in sixth. Of course, the fast stuff does come back, but this slowdown is awkward here. You could see “Return To The Heroes Museum” as the sequel to “Heroes Museum”. It begins quite fast, your typical uptempo Heavy Metal. The harmonics of that era (see e.g. IRON MAIDEN) weren’t forgotten either. After that the pace is set at midtempo. Last but not least, the title track. The bass has the honour to introduce it and lay the basis for the rest of the song. Guitars and drums are added in such a way so as not to disrupt the tempo. It’s another slow rocker, more atmospheric this time. And again the band made sure it was catchy enough. Around halfway the tempo increases, not only to pave the way for the solo. And surprise, surprise… a tribal drum moment closes off the studio sessions. The live part of the EP is a nice addition, a back-to-back kind of presentation of OSTROGOTH. As you can expect, it’s classic Heavy Metal to the bone. Fast, flashy and qualitative. In short: This is food for fans of Classic Heavy Metal, make no mistake. The songs, the production, … it’s all kept to keep the image, sound and atmosphere of those days intact. “Last Tribe Standing” is for anyone out there reminiscing about the golden 80’s and/or seeking new material of this genre. Or if you’ve always wanted to add OSTROGOTH to your collection, but never could… until now.